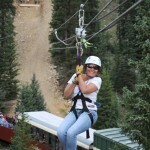 The Standard Two-Hour PROSPECTOR ZIP LINE TOUR: 5 ZIP LINES! Plan to spend approximately two hours on this exciting tour. After check-in at the Base Camp on our 2,500 acre Private Preserve, board our 6 ton MONSTER TRUCK or drive a Polaris ATV up through the forest to the first zip line departure platform at 11,200 feet. The type of Shuttle vehicle will depend upon the number of guests booked for the tour time. Enjoy spectacular panoramic views of two of the tallest peaks in North America, Mt. Elbert and Mt. Massive, from the deck of our Yurt. You will also see some of the historic patented gold mines on the property and possibly wildlife. While zip lining you can fly side by side experiencing different elements of speed, distance off the ground and terrain on each of the FIVE SEPARATE ZIP LINE SECTIONS. You can also stop at one of the bubbling streams in the area for cold drinks and snacks. A shuttle vehicle will return you to Base Camp at the end of your tour. Photo Service is also available on site. Tour Times: 9:30am, 10:30am, 12:00pm, 1:00pm, 2:30pm and 3:30pm. Please arrive 30 prior to Tour Time.